The current food habits along with the life style people follow today, makes it imperative to get teeth cleaned professionally. The dentist has more access and can view all regions of the mouth more clearly and hence can do a through job of cleaning and removing all the plaque, calculus (deposits) present in between or on the surface of the teeth which accumulate over a period of time. Ultrasonic scaling makes this process quick and more efficient. Cleaning your teeth regularly(ONCE IN SIX MONTHS) keeps your gums healthy and helps maintain good oral hygiene. Dental restoration or dental filling is a dental restorative material used to restore the function, integrity and morphology of missing tooth structure. The structural loss typically results from caries or external trauma. Materials used may be gold, amalgam, dental composites, resin-reinforced glass ionomers, porcelain or any number of other materials Here at Thanjai dental centre, we use state-of-the-art tooth-colored resin and porcelain materials, so even teeth that have been heavily restored with unsightly and unhealthy silver/mercury fillings can be made to look pristine again. 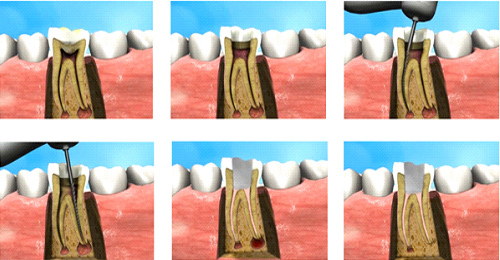 Root canal treatment(RCT)is a procedure done to save the damaged or dead pulp in root canal of the tooth by cleaning out the diseased pulp &reshaping the canal.The canal is then filled with rubber-like substance called gutta percha or other similar material to prevent recontamination of the tooth.Depending on the condition of the tooth and extent of infection,RCT is carried out either as SINGLE sitting procedure or may involve one to three appointments.A CROWN is mandatory after RCT to prevent further damage of tooth structure and to improve function of rct treated tooth. 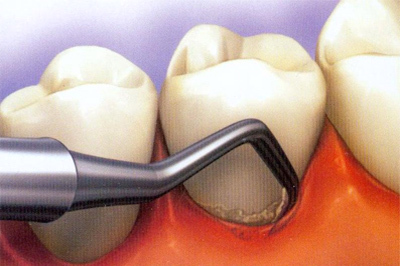 Extractions can be simple or surgically done. Simple extractions are usually performed when the tooth is visible, already loose and only require dental forceps to lift it after it has been rocked back and forth. On the other hand, surgical extraction involves the removal of teeth that cannot be easily accessed because they have not fully erupted or they have broken under the gums. This requires an incision and frequently, the tooth to be extracted are split into multiple pieces to be able to easily remove it. When your dentist decides that a tooth has to be removed, he may either do it on your regular check up or schedule this procedure. He may then recommend cosmetic dental options thereafter. As for pain control, you will also be given the choice of oral sedation or inhalation sedation. But you need not worry about the pain, because we'll take care of it. 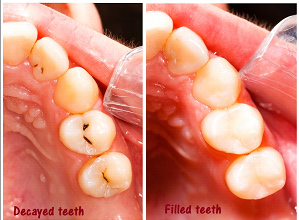 Over time, teeth can be damaged, cracked or weakened by decay. 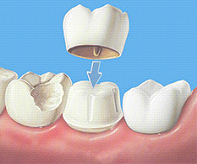 Dentists use a crown to entirely cover or "cap" a damaged tooth. *Crowns are made to match the color of your natural teeth, and besides strengthening an impaired tooth, these can be used to improve your teeth’s appearance, shape or alignment. Dental crowns can be fashioned from stainless steel, ceramic, acrylic and metal alloys. Unlike removable devices such as dentures, crowns are cemented onto existing teeth or implants, and can only be removed by your dentist. With good oral hygiene, crowns can last a lifetime. A crown may come loose or fall out if the underlying tooth is damaged by gum disease or tooth decay. While a crowned tooth does not require any special care, it is important to keep your gums and teeth healthy by brushing with fluoride toothpaste for two minutes twice a day and flossing daily. Dentures are removable replacement for missing teeth,gums and bone that are caused due to tooth loss. A partial removable denture may replace a single tooth or multiple teeth. Complete dentures are replacements for all the teeth in one or both jaws and are normally held in place by the saliva and the close adaptation of the denture base to the tissue.They improve the chewing ability and speech and provides support for the facial muscles.It greatly enhances the facial appearance and smile. 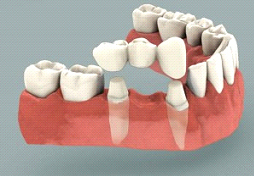 Dental bridges, also known as fixed removable dentures, literally bridge the gap created by one or more missing teeth. *A typical bridge is made up of two crowns (one on either side of the gap) and a false tooth/teeth in between. Bridges are attached to surrounding natural teeth or dental implants for support. The anchoring teeth are called abutment teeth and the false teeth are called pontics. Pontics can be made from porcelain, alloys or a combination on materials. Its more comfortable for the patients than removable type as it rests entirely on the existing teeth and also easy to maintain than removable type . Tooth decay is caused by combination of food and bacteria. A clear, sticky substance called plaque that contains bacteria is always forming on your teeth and gums. As the bacteria feed on the sugars in the food you eat, they make acids. The acids attack the teeth for 20 minutes or more after eating. Over a period of time, these acids destroy tooth enamel, resulting in tooth decay. We carry out preventive dental treatments like using pits and fissure sealants,fluoride application ,professional applications of anti-cavity medicaments.and finally doing periodic dental check-up thereby detecting decay at the early stage. Bad breath also known as Halitosis is a very common problem affecting many people often caused by oral hygiene problems.Halitosis can also be caused by smoking, spices diets, or a medical disorder or conditions such as diabetes, GERD, lactose intolerance, gum disease, gastric problems, respiratory infections, dry mouth syndrome, and certain drinks such as coffee, tooth cavities, loosely fitting dentures and braces. Dentures or dental appliances, such as braces, can contribute to bad breath. Most often it is due to food particles that are not properly cleansed from the appliances. 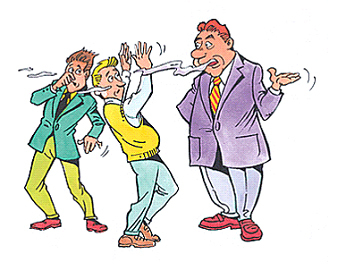 *Common symptoms of bad breath include bad breath smell, bad taste or taste changes, dry mouth, and coating on the tongue. 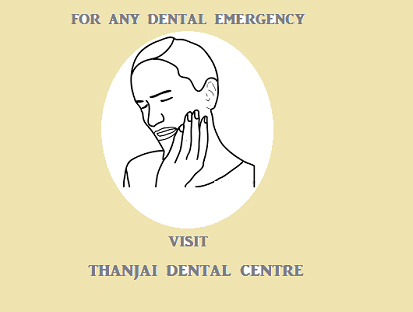 At Thanjai Dental Centre, we will assess your mouth to find the cause(s) of halitosis and establish a proper professional hygiene program to reduce the build-up of plaque. Any obvious damage to a tooth – chips, fractures, lost fillings or broken crowns - should be treated as soon as possible. If it hurts, it's an emergency. If you call us right away, our dental experts can repair the damage and prevent it from getting worse.